As a foodie and cookbook author, I have the real honor of belonging to several food-related organizations. Among them is the venerable James Beard Foundation. As part of my membership, I receive several different newsletters that are chock-full of fascinating tidbits. I always find some take-away that serves me well in the future. But the latest issue contained something particularly interesting about a topic I thought my readers would really enjoy. Not just any frozen desserts, mind you! These are unexpected, unusual frozen desserts that will tantalize you...surprise you...delight you. I'd love to share them with you now. 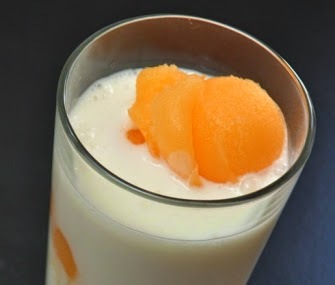 For her delightful spin on the classic soda shop float, pastry chef Megan Romano combines the tangy and creamy flavors of a creamsicle with the frothy, bubbly texture of a New York-style egg cream soda. To make the sorbet, mix the sugar and water together in a pot. Bring to a boil; continue boiling until all the sugar has dissolved, about 2 minutes. In a medium bowl, combine 1 cup of the syrup with the tangerine juice and corn syrup. Churn in an ice cream machine. Cover with plastic wrap and store in the freezer. In a small bowl, whisk together 2 tablespoons of the milk with the cornstarch and set aside. Combine the remaining milk with the sugar, cream, corn syrup, and salt in a small saucepan. Set over high heat and bring the liquid to a simmer. Remove from the heat and whisk in the cornstarch mixture. Return to the heat and cook for another 2 minutes. Remove from the heat and refrigerate for 1 hour. Whisk in the yogurt. Refrigerate until ready to serve. To serve, pour the seltzer into the custard. Froth with a hand mixer until combined and airy. Divide among 4 tall glasses. Add a scoop of sorbet to each float. 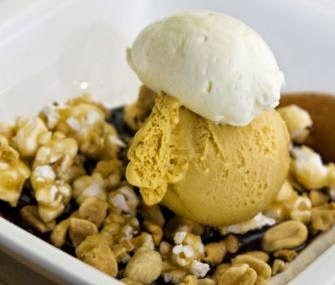 Cindy Bearman of ABC Kitchen piles sweet and salty treats into this rendition of the classic sundae. To make the ice cream, heat a large pot over medium heat. When the pan is hot, sprinkle 3/4 cup of the sugar evenly over the bottom of the pan. Bring to a boil and cook until the sugar is a deep amber color, about 5 minutes. Slowly add the milk and return to a boil, stirring until any bits of hardened caramel have melted. Whisk the egg yolks with the remaining sugar in a large mixing bowl, then slowly and carefully stream the hot caramel into the bowl, stirring constantly. Return the mixture to the pot and stir over low heat with a wooden spoon. Cook until the custard can hold a line drawn on the back of the spoon, about 10 minutes. Strain the custard through a fine-mesh strainer. Add the cream and salt; mix well. Chill in the refrigerator overnight. Process in an ice cream maker according to the manufacturer’s instructions. Store in the freezer. To make the peanuts, mix the sugar and corn syrup with a few tablespoons of water in a medium sauce pot. (The mixture should have the consistency of wet sand.) Bring to a boil over low heat, then add the butter. Cook until the syrup is caramel in color, about 15 minutes. Add the peanuts and mix quickly until evenly coated. Pour onto a Silicone mat-lined cookie sheet, spread out with a spatula, and let set. Store in an airtight container. To make the popcorn, mix the sugar and corn syrup with a few tablespoons of water in a medium sauce pot. Bring to a boil over low heat, then add the butter. Cook until the syrup is caramel in color, about 15 minutes. Place the popcorn in a large bowl. Pour the syrup over the popcorn and mix quickly. Pour onto a silicone mat-lined cookie sheet, spread out with a spatula, and let set. Store in an airtight container. To make the fudge sauce, warm the sugar, water, cocoa powder, and corn syrup over medium heat until just boiling. Add the chocolate and butter and whisk until smooth. Stir in the vanilla extract and salt. Mix well. Remove from heat and cover to keep warm, or chill in the refrigerator until needed and gently reheat before serving. To serve, break up some of the candied peanuts into small pieces. Place 3 scoops of ice cream in each serving bowl. Top each serving with some peanuts and popcorn. Finish with warm fudge sauce. You can leave your ice cream maker in the closet: this food-processor method, developed by frozen dessert queen Jeni Britton Bauer, results in an ultra-smooth sorbet. Using a tea strainer or a fine sieve, strain the sun tea, pressing on the tea leaves to extract as much liquid as possible. Discard the leaves. Combine the tea with the reserved cantaloupe purée. Refrigerate the sorbet base until cold, at least 1 hour. Pour the mixture into a large, shallow baking dish and place in the freezer. Scrape the ice crystals with a fork every 30 minutes. When the base is completely frozen, transfer to a food processor and purée until smooth. Quickly transfer the mixture to a new container and freeze again until serving. 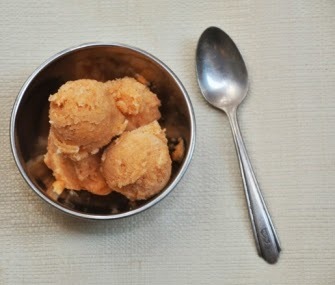 Alternatively, process the base in an ice cream machine until smooth, thick, and frozen. Transfer the mixture to a new container and freeze again until serving. Christopher Edwards served this semifreddo with a dark chocolate cake and roasted nut turrón at his Beard House dinner. Maple syrup lends this frozen dessert a deep, robust flavor. Line a 48-ounce loaf pan with plastic wrap, using enough so that about 4 inches of plastic hangs over the edges of the pan. Whip the whipping cream to soft peaks. Set aside in the refrigerator. In a large bowl set over a pot of boiling water, whisk together the egg yolks, 1 1/2 cups sugar, 1/4 cup maple syrup, and salt. Continue to stir until the mixture is very thick and coats the back of a spoon, about 15 minutes. Remove from heat and let cool for 2 minutes, then transfer to the bowl of a stand mixer. Using the whisk attachment, whip the mixture until it has doubled in volume. Fold in the whipped cream and dried cherries. Pour the mixture into the loaf pan, cover loosely with the overhanging plastic wrap, and freeze overnight. 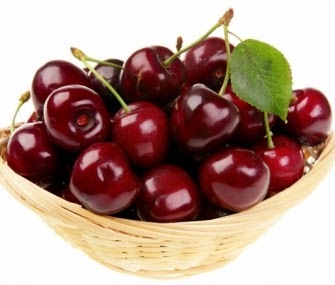 When ready to serve, combine the fresh cherries, water, 1/4 cup sugar, and 1 tablespoon maple syrup in a small sauce pot. Bring to a boil and cook over low heat until the sauce reaches a syrupy thickness, about 7 minutes. Stir in the lemon zest. Remove the frozen semifreddo by inverting the loaf pan onto a cutting board and carefully removing the plastic wrap. Slice the semifreddo into individual portions and serve with the warm sauce.